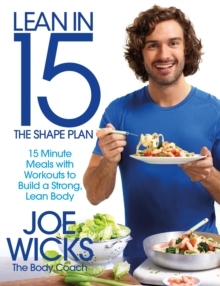 The second book by the record-breaking bestselling author Joe Wicks. EAT MORE. BUILD MUSCLE. BURN FAT. Lean in 15: The Shape Plan introduces a new way of eating and training to build lean muscle and burn more fat. Joe Wicks, aka The Body Coach, has helped hundreds of thousands of people transform their bodies and feel amazing. In the Shape Plan, he shares 100 delicious recipes and four new workouts to take your fitness to the next level. Are you ready to start your transformation and get Lean in 15?